With a little curly locks with hair down to the middle of her back hair brushing isn't easy and totally impossible unless I have a good detangler spray to hand, it often sounds like I'm murdering my child when in fact all I've dared to do is touch her hair. A few times I've sent the reassuring message to my neighbour to promise I'm not hurting her in anyway it's just hair brushing time. 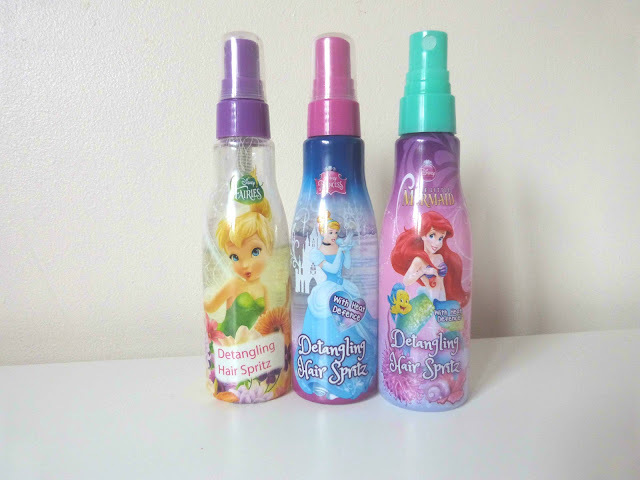 The only way she will ever consider letting me go anywhere near her (before I've started the whole bribing thing) is to tell her how magical these little disney detangling spritz are, what little girl doesn't want hair like Elsa & Anna or Ariel? Just like that hair brushing becomes so much less stressful I may have to rugby tackle her once or twice because she's run off every now and again but we soon get her hair looking curly and princess like again rather than the stig of the dump style she supports way to often than she should. Where can you get these wonderful bottles of magic I hear you ask? Even better you can also get other items in the different princess ranges shampoo & conditioner, hand wash, nail varnish, lip balm there's even a cute little jewellery collection too.